My friend Steven (aka "@myopicaardvark") is a huge comicbook fan... he gets all animated about them in the same way I do about music. When DC Comics took their decision to reboot 52 comics... I took the opportunity to start following a storyline. The storyline I decided to follow was Justice League... I have followed their stories previously in graphic novels borrowed from Library or in the animated TV series... and kind of like the whole "team dynamic" thing... that and I love Wonder Woman but feel a bit odd buying her storyline. Oh and by buying into the JLA I get Batman, Superman, Green Lantern, Flash AND Wonder Woman. 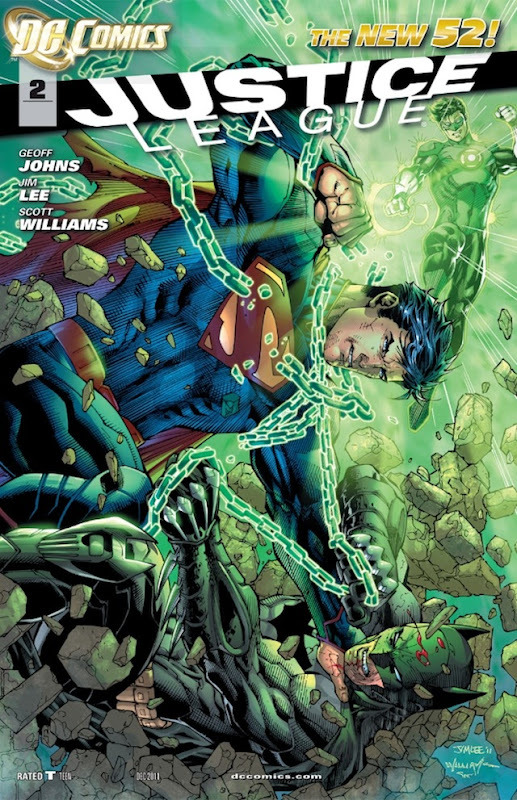 In essence, I love a good story and the work Geoff Johns and Jim Lee have undertaken impresses me... albeit I don't think everyone is as enamoured as I am... but then I am new to this. The artwork is vivid and the storyline intriguing. What has enabled me to start this journey, apart from the DC reboot, is my iPad. I'm buying the comics for my iPad... I am not buying physical media. This is another way the iPad comes into its own... the comic looks fab and is designed to be read either page by page or frame by frame... which I like. I also like that I can download the comic... once I've bought it... to my iPhone, iPad AND Dayna's iPhone too. She's coming along with me on this journey. Whilst I am not convinced that the iPad is future of magazine publishing... well not yet, anyway... I do see a very healthy future for comicbooks. The iPad is wonderfully visual and comics are wonderfully visual too... this is a part of publishing that the Kindle can't touch yet... especially the grayscale e-Ink versions.